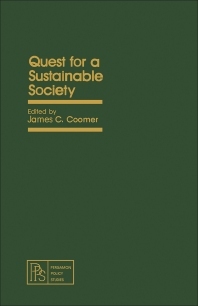 Quest for Sustainable Society discusses numerous efforts and activities for the quest of sustainable society. This book is organized into four parts encompassing 13 chapters. The first part deals with the biological, genetic, cultural, and technological diversity of the sustainable society. This part also examines the social and economic implications of widespread conversion to biomass-based fuels. The next two parts look into the qualitative components and institutional modifications for a sustainable society. These chapters discuss the role of politics, ecosystem education, and business organizations in the quest for a sustainable society. The fourth part presents two case studies that demonstrate the consequences of sustainable growth. This book will prove useful to sociologists, economists, and researchers.